Prefer Pets Carrier for 2 Puppies or Kittens | On Sale and Free Pads! FREE pair (2) of Breathable Pads with the purchase of your Prefer Pets pet carrier. Help protect your carrier for years of traveling with your cat or dog. On Sale! Save $6.00! The Prefer Pets Carrier provides your pet a safe and comfortable environment when traveling. Great carrier for puppies and kittens as it comes with a removable divider. Two small puppies or kittens (measuring less than 8" from tip of nose to base of tail) can fit in the carrier. It is soft-sided so it can be compressed to fit under most airline seats. You can also buckle it in your car for safe auto travel. The carrier allows entry at both ends as well as through the top. Flaps on the sides and top of the carrier can be closed to allow privacy or opened for increased ventilation. Fully lined and padded interior. For your pet's comfort and safety and to conform to commercial airline regulations if flying, your pet should be able to stand up and turn around in its carrier. 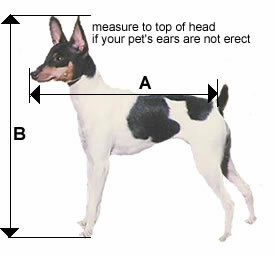 Measure your pet carefully before ordering using the chart below.